Dedicated to John Kawa. He was a young man growing up in St. Michael’s parish like so many other young men. He served as an altar boy, played on the Parish basketball team, and was part of the Ukrainian dance group. In the conflict of World War II he donned an American Army uniform to serve his country in the cause of freedom. He was killed in that war. His parents, John and Anna Kawa, prayerfully donated donated the rapedia in his name. 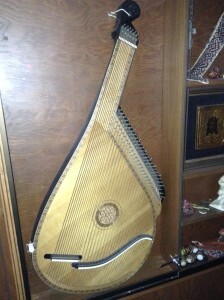 The Professional Bandura (display case in the hall). 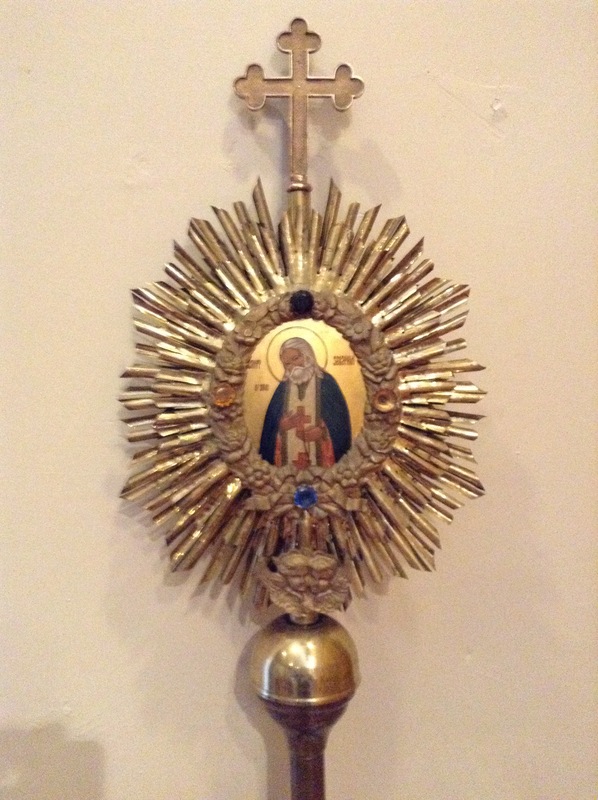 Donated by Olga Louis Zagranisky-Louis; “I know how precious the Church was to my parents (Michael and Tekla Lukienyk-Louis) and the great pride they placed in the Ukrainian heritage and in St. Michael Ukrainian Orthodox Church. Sharing in the pride of our Ukrainian heritage, I wish to donate a Bandura in honor of Mr. Peter Teper, a man who has so well served the Parish in a musical capacity. By giving this Bandura, I wish to honor Peter Teper for all the work he has dedicated to St. Michael’s and the Ukrainian community there. 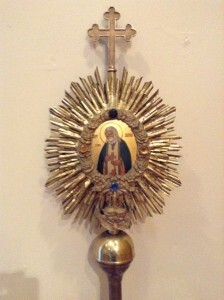 I hope that this Bandura will be housed and displayed in such a manner so as to educate and inspire future generations to come.” She also established an “The Louis Ukrainian Orthodox Sacred Arts Trust Fund” fund with a donation of $20,000 which has been used to purchase many things that beautify our church. The history of the monument and cross at the entrance of the St. Michael’s Ukrainian Orthodox Church Cemetery is as follows, as related to my by my parents, Michael and Ksenia. John Chaharyn, the brother of Antonia Teper-Joseph, Michael, Philip, and William Chaharyn, stated that there should be a cross in the cemetery, as was the custom in the old country. So he designed, created, and built the cross and monument at the entrance to the cemetery. Shortly after the erection of the cross, John was accidentally killed by a dynamite blast while digging a well in Manville. The people of the parish at that time stated that since he built the cross and monument he should be buried there. The day he was killed, his niece Anna Chaharyn, the daughter of Michael and Ksenia, was born. Incidently, my dad, Michael Chaharyn, was a member of the committee that negotiated the purchase of the present property (74 Harris Ave.) on which the present St. Michael’s Church is built. Very Rev. Mitred Fr. Eugene Meschisen, fell asleep in the Lord after a lengthy illness on Bright Thursday, April 12, 2007. Father Eugene was born in Providence, RI, was a member of St. Michael Parish, Woonsocket, RI and was accepted for enrollment to St. Sophia Seminary in 1982 and graduated in 1985. Prior to his seminary education, he earned a Bachelor’s Degree from Bryant College in 1977 and a Master’s Degree in Business Administration from Suffolk University in 1978. Although successful in his secular employment, Fr. Eugene hungered in his soul for spiritual satisfaction and thus, cast aside all possible future “secular business” success in order to go about the “Lord’s business” in priestly service. Fr. Eugene was ordained by Metropolitan Mstyslav to the Deaconate at St. John Parish, Johnson City, NY in 1985 and following his ordination to the Holy Priesthood by Archbishop Antony in December 1985, served at St. Michael Parish, Hammond, IN (Western Eparchy) from 1986 until his retirement in 2005. Fr. Eugene served a three year term on the Metropolitan Council of the Church and as Chancellor of the Western Eparchy under His Eminence, Archbishop Vsevolod. The medium sized enameled chalice set belonged to Fr. Eugene. One of Fr. Eugene’s best friends, the Very Rev. Fr. Andriy Pokotylo, inherited this chalice set after Fr. Eugene’s repose. When Fr. Andriy learned that the 2013 fire had damaged all of St. Michael’s regular chalice sets, he donated this chalice set to the parish, desiring not just to help the sister parish of his own parish (he was priest of St. Mary’s parish in New Britain at that time), but to help the parish that had nourished his friend from birth. St. Mary’s also donated extra vestments and a beautiful icon frame to help St. Michael’s recover from the fire.